Exclusive to Euronics and Agent Stores, the U1DCC1BN0B is packed with a range of innovative features. From baking delicate patisseries to roasting joints for a family get-together, this NEFF double oven can help you cook everything to perfection. 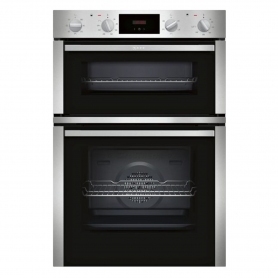 Cook a range of amazing meals with this versatile electric oven from NEFF. 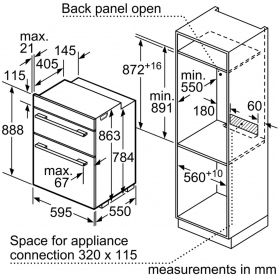 Offering a total of three shelves and a net capacity of 105 litres, space won’t be an issue, so you can host dinner parties to your heart’s content. With the CircoTherm® function, you’ll be able to roast and bake in the NEFF U1DCC1BN0B at the same time, on up to three levels – multitasking has never been easier. You can even control the direction of heat with the Top/bottom option. Achieve a beautiful golden brown finish with the top heat function to impress your family and friends. This electric NEFF oven comes full of features to give you ultimate ease of use. Featuring a telescopic rail design, you can pull out the oven’s shelf safely and easily. You’ll never again have to risk reaching into a hot oven. And, the EcoClean Direct technology helps the U1DCC1BN0B keep itself cleaner. The specially designed coating will absorb any food splatters – saving you the time and elbow grease. Want to keep your oven doors looking spotless? Both doors are also removable, making cleaning effortless. The main fan oven is rated ‘A’ for energy efficiency, helping the NEFF U1DCC1BN0B be kinder on your pocket and the environment. You’ll also find a programmable timer on the main oven to help you keep on top of your cooking’s progress. 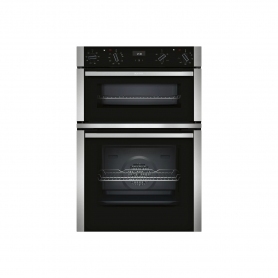 This NEFF built-in double oven is a fantastic choice for you and your kitchen. Exclusive to Euronics and Agent stores, you won’t find this model anywhere else – order yours today.